Hardware is still hard. And yet, hardware is only one part of an IoT product or service. There is software and connectivity. Then there is data storage, processing and analytics. Most importantly, don’t forget customer interactions and experience. So it’s fair to say building an IoT product or service is complex. How does someone building a IoT product or responsible for ongoing product management take a more structured approach? Ask all the right questions? Ask those questions in the right order? That’s where the IoT Decision Framework by Daniel Elizalde comes in and does a great job. Ensures that all the relevant areas are considered. Starts with UX (user experience) and then goes on to the other decision areas in an ordered fashion, ending with standards & regulations. That way UX drives data, UX and data drives business thinking, etc. It prompts every decision area being considered for every layer of the IoT Technology Stack. For example, security is considered across each of the areas of devices, embedded software, communications, cloud platform, and applications. There’s flexibility to add other decision areas based on specific uses. The framework ensures it is considered in the right order and also at each layer of the technology stack. Best results come from iterative use with some of the later decision areas requiring re-thinking of the previous ones. At first glance, the framework looks deceptively easy and even obvious. 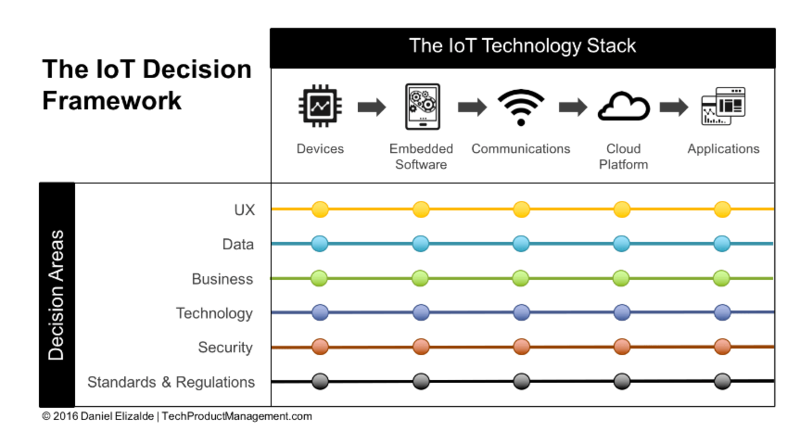 Yet, actual use of the framework for an IoT product shows how it helps an IoT product developer or manager uncover some decision areas that were otherwise not so easy or obvious. I also recommend using Daniel’s IoT Decision Workbook. Requires giving your email address to get it for free (people who have concerns about giving up their email address will know how to get around that). The workbook implements the structured approach and documents decisions, making it a valuable tool. All in all, the IoT Decision Framework is really helpful and welcome. Thank you for including my content. I’m glad you found it useful. I agree that the UX – and I mean the entire Experience = use cases + scenarios/journeys + UIs should be the differentiator because HW and sensors will commoditize and communications are plumbing.